The reality of Donald Trump sitting in the highest ranked American office in less than 28 days is still unsettling to me. Trump’s election feels like a scar that may heal in time, but the wound’s initial shock will forever be remembered. On November 8, it became blatantly evident that many of our American brothers and sisters believed that Mr. Trump was the best solution to their troubles and concerns. Whether they ardently or begrudgingly supported Mr. Trump’s candidacy, over 62 million Americans decided that his racism, sexism, ableism and xenophobia were not dealbreakers. As an individual that values inclusivity and equity, that reality stings. As a woman of color, that reality stings a bit deeper. It may be coincidental that we are approaching the winter solstice, when our days get shorter and darker. For me, the changing landscape echoes the pervading darkness looming from the election. We continue to be bombarded with messages that highlight our divisions. Undoubtedly, there are divisions in need of mending – however, to believe that our divisions are the entire American narrative ignores the numerous individuals across the nation that have and continue to unite with one another. When all I could do was cry on my commute the morning following the election, the individual next to me reminded me that we’re in this together. At a time when I had grown more despondent than hopeful, thousands of students showed me otherwise by coming together to lobby their members of Congress on criminal justice and immigration reform during the Ignatian Family Teach In. As I grew weary at the state of our nation, U.S. military veterans traveled to North Dakota to support the Standing Rock Sioux in opposing the Dakota Access pipeline. When I felt plagued by inaction, activists were organizing demonstrations, marches and sit-ins aimed at protesting the normalization of intolerance and bigotry. 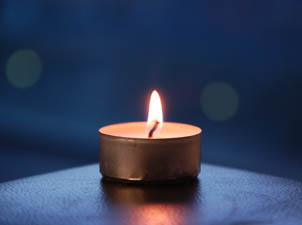 These glimmers of hope are analogous to the power a lone lit candle can have in a dark room. Despite how small or dim that candle may be in the midst of pervasive darkness, that candle still possesses the ability to illuminate. When that candle is joined by another candle, the effect can be profound. Quite frankly, I may never come to terms that Mr. Trump was elected notwithstanding his campaign platform. However, as difficult as it may be, I refuse to submit to the notion that Donald Trump is representative of the American people. Instead, it’s these glimmers of hope amidst the chaos and darkness that I choose to uplift. This entry was posted in Emerging Justice Seekers, Front Page on December 23, 2016 by networklobby.